Bridging the gap between up and coming voice over talent and the hard working producers pushing out commercial content. Sneak preview of Episode 1. Official launch date is May 5, 2019! Your host, Chris Laning has been camping out on the “pay to play” sites since 2011 cutting literally thousands of demos across a wide variety of project types. He is an “everyman” type (aren’t we all), who is equally comfortable doing a technical explainer, a humorous commercial spot, or an emotional spot. His background in theatre also makes him great for character and dramtic pieces. 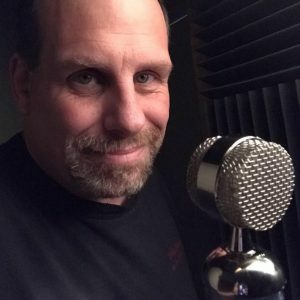 Chris has also been creating and producing podcasts since 2006. Besides his own podcasts, he produces podcasts for several business clients. In fact, Chris has edited thousands of podcast episodes over the years. He is quite adept at editing spoken word (which can be a plus for a voice over artist as well)! “Voice Over Match” is designed to bridge the gap between up and coming voice over talent and producers, particularly in the realm of “pay to play” sites. Demystifying the process by interviewing producers to discover how they process auditions, what they love to hear, and what they hate to hear. Gaining insight from industry professionals to help improve the talent’s skills and success. Having the opportunity to offer feedback which will hopefully lead to a higher quality of submissions. Having a chance to be exposed quickly to some of the talent through the “Talent Spotlight” segment.